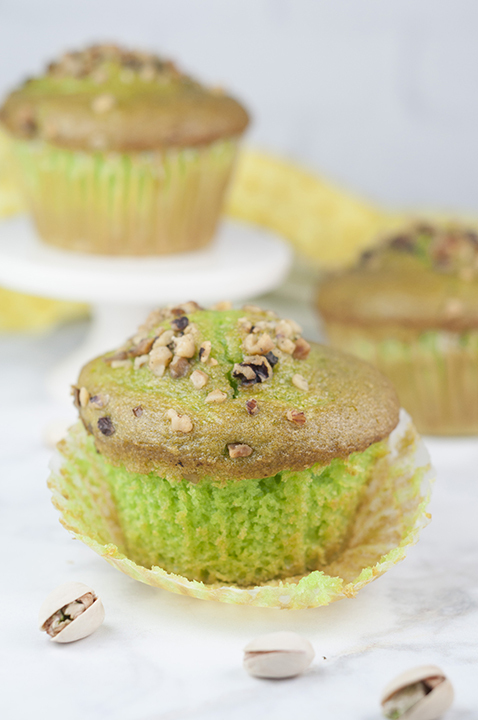 Easy, moist Green Walnut Pistachio Muffins recipe that is great for St. Patrick’s day breakfast, dessert, or Easter brunch idea! You’ll love that special crunch from the nuts on top! I love green food and we’re coming up on St. Patrick’s Day soon! I was feeling like something green and festive and these Green Walnut Pistachio Muffins were what I came up with. These muffins came out so soft and not the least bit dry! There is nothing worse than biting into a delicious looking muffin and having it be dry, am I right? By the way, isn’t there a word other than “moist” that can help get my point across? Muffins are one of my favorite things to bake. I know we’re coming up on spring, but these Pumpkin Chocolate Chip Muffins are my favorite! I’m not that great at decorating cakes and cupcakes, so I like that muffins don’t need any extra TLC after baking. I was ecstatic with how they rose just the right amount in the oven. If you like to do special things for your kids on St. Patrick’s Day, there’s no better way to do it than have them wake up to these muffins that day. You can make them the day before and they will still taste just as fresh! We ate them for days and they tasted freshly baked. If you go a little bit green crazy on St. Paddy’s Day, add these to your list. If you’re loving green food for St. Patrick’s day, definitely these this Triple Layer Key Lime Cake. 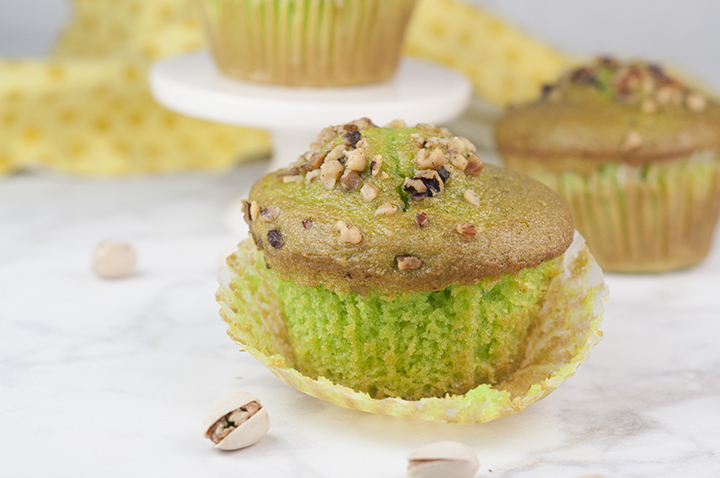 Enjoy these Green Walnut Pistachio Muffins with a hot cup of coffee any time of the year! 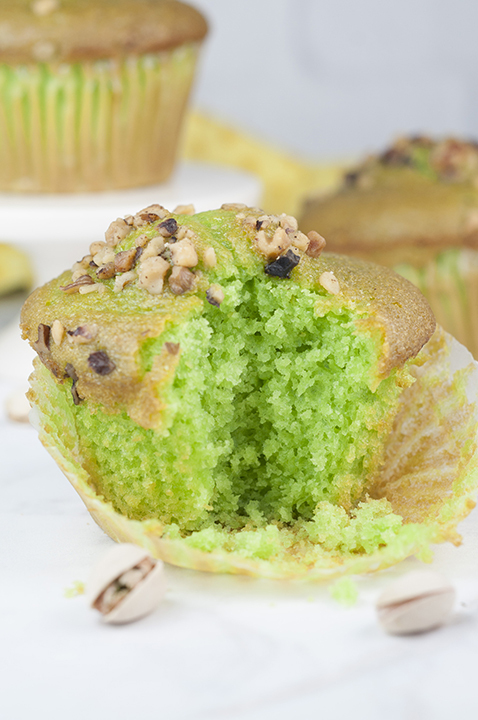 Pistachio is just such a great flavor for muffins. Try them and see for yourself! 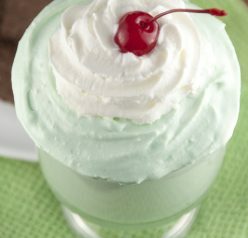 You can also access all of my St. Patrick’s Day Recipes in one place. Easy, moist Green Walnut Pistachio Muffins recipe great for St. Patrick's day breakfast, dessert, or Easter brunch idea! I love the crunch from the nuts! Preheat oven to 375 degrees, and spray 12-cup muffin pan with non-stick cooking spray (if not using the liners, but liners is much easier). In a large mixing bowl mix all dry ingredients: dry pudding mix, flour, granulated sugar, brown sugar, baking powder, baking soda, and salt. In a separate mixing bowl, mix all wet ingredients: eggs, vanilla extract, milk, and oil. Do not add food coloring at this point! Combine wet and dry ingredients together, and add a few drops of food coloring until desired green is achieved. 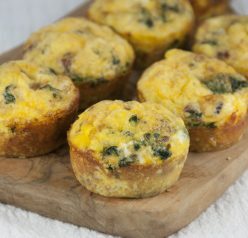 Fill muffin cups about ¾ of the way, sprinkle walnuts on top, and bake for 15-20 minutes, or until toothpick inserted into the center comes out clean. These sound delicious and look so pretty! What lovely green muffins! I’m a muffin fiend so love having any new varieties to try. These are perfect for St. Patrick’s Day! What a fun treat! Love anything with pistachios!! thank you very much you help me ???? I love practically anything with pistachio and these muffins sound delicious! Cinnamon Spice Sweet Potato Muffins using Homemade Muffin Mix. 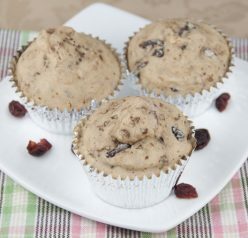 You can find the recipe for our homemade muffin mix here. Cinnamon Spice Sweet Potato Muffins (Muffin Mix) Author: picklebums. com Serves: 12 large muffins Ingredients ¼ cup oil or melted butter 2 eggs 1½ cups mashed sweet potato (approx 1 large potato) 2½ cups of homemade muffin mix 2 tsp cinnamon 1 tsp ginger 1 tsp allspice ½ cup of milk Instructions Peel and cut a large sweet potato into cubes, cook it in the microwave, or steam, it until soft enough to mash. Made these, they are great thank! Family loves them! Question… anyone try this recipe in a loaf pan to bake a sweet bread? Thinking of trying it.